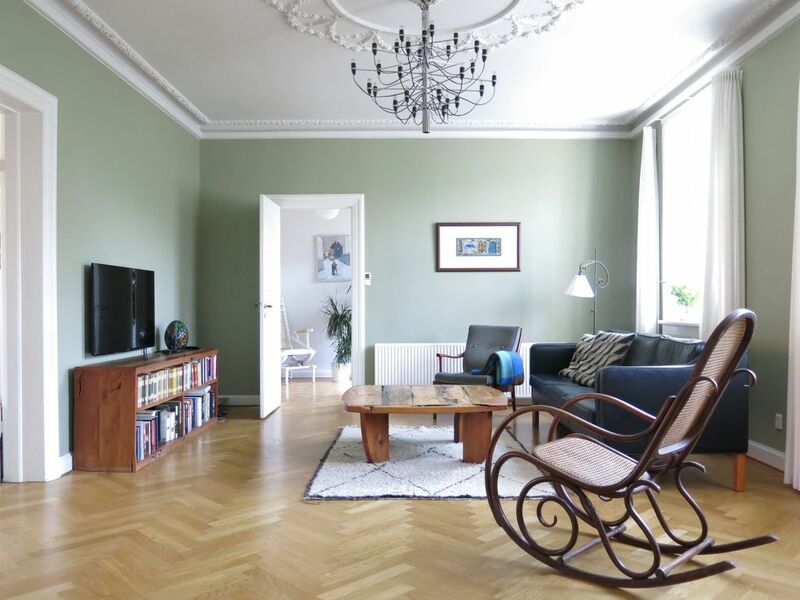 Large and lovely 230 m2 apartment located in Østerbro with a view of Fælled Park. The apartment has space for 6 persons i a combination of children and adults. Østerbro is in the northeastern part of Copenhagen. It is an exclusive and peaceful area. The Little Mermaid and Langelinie are this neighborhood's main attractions and is visited every year by many tourists. The neighborhood is also the home of many embassies such as the American, Indian and Brittish embassies. The area is know for its excellent shopping streets Østerbrogade and Ndr. Frihavnsgade, where there are many cozy cafés and unique designer boutiques. In the summer there is much activity around Svanemøllen beach park. If you want to relax, you can enjoy a beer at Café Bopa together with the local residents, or head over to Ryesgade where there are any number of cafés and yoga studios. Fælled Park, Copenhagen's green oasis, is also a popular meeting place and gathering point for folk festivas such as the Carneval at Pentecost. Copenhagen Stadium is beside Fælled Park. Here you can watch football games with the local team FCK or see a concert with international artists. Large and lovely 230 m2 apartment in Østerbro looking out over Fælledparken. It is said that Stauning once lived in this building. The apartment has space for 6 persons in a combination of children and adults. Hall, living room, dining room, kitchen, combined toilet / bathroom with shower, guest toilet, small balcony, master bedroom, combined office / bedroom with sofa bed, child's bedroom with junior bed and child's bedroom with a high bunk bed. There is a small balcony where you can get fresh air. WiFi, TV with limited channels, dishwasher, washing machine and clothes dryer. The apartment is on the 3rd floor in a building without an elevator. Beautiful spacious apartment in a safe clean area of Copenhagen. Kitchen well stocked and having 2 toilets was handy for our family. 2 queen beds very comfy, one twin in third room, 4th bedroom had only a toddler bed, so perfect for young families. Easy meeting to get into apartment at start with informative booklet on how to use everything in the apartment. Would definitely stay here again!